There will be no open house on Tuesday 5 June. Commencing on Tuesday 12 June and finishing on Tuesday 10 July we will be running Contentment in Everyday Life at the Newtown venue. This course will replace open house for that period of time and will be open to the general public. 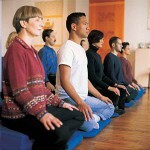 No previous experience in meditation is required. Each evening will include: Meditation instruction, interactive exercises, meditation practice and a talk on the key theme by Archarya Eve Rosenthal. Open house will commence again regularly on July 17. But don’t wait for that register for CIEL More information is in upcoming programs.